Which Ambulance is Best for You? The Type 1 F350 is a quick nimble heavy duty ambulance, the front end protection you need in the cab plus maneuverability in tight traffic. In compartment #1 oxygen and backboard storage is provided, with miscellaneous storage in compartment #2 and #3. Order your today complete with running boards plus a low amperage lighting system. 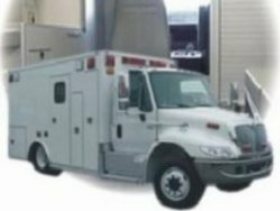 The Type 3 ambulance design is the smoothest ride of all vehicles, extra length patient compartment is available on Ford E-450 chassis. Available in Ford E-350 dual rear wheel chassis with gasoline engine. The Ford E-450 super duty chassis is designed for very low operating cost is complete with the Ford gasoline engine. Chevrolet G3500 and G4500 series is also a very popular combination if you desire extremely low operating cost per mile. Some of our customers have experienced over 250,000 miles per chassis with proper maintenance and so can you. Lower initial acquisition cost with the gasoline engine, as opposed to the incremental cost of a diesel powertrain, will make the gasoline-powered E-Series accessible to a wider audience of municipalities and private ambulance fleets. Reduced maintenance, extra protection in chassis, pass through window or walk through designs available in International, Ford, Chevrolet and Freightliner chassis. A heavy duty air suspension with dump valve is provided for all medium duty ambulances to provide easy patient loading and unloading. Upgrades available include 12 volt electrical load managers, 110 volt generator power plants with converters, and special body layouts for neonatal, command post and communication units. 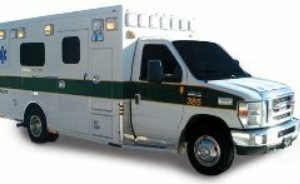 If you are looking for a smaller, yet fully functional, customizable ambulance, the Type II is the right choice. Even though the Type II is a smaller ambulance, it is built with the same roll cage, steel super structure as our modular ambulances, so you won’t be sacrificing safety. 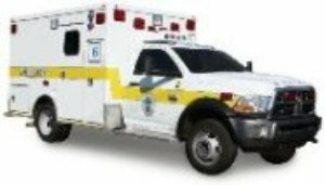 What are the benefits of a Type II ambulance versus a Type I or III modular ambulance? Easier to maneuver and less expensive than a modular ambulance. A Sprinter is available on a Mercedes chassis. Easy to clean interiors are provided with rounded corners for safety. A low amperage electrical system is included on each vehicle for dependability. The Type 2 is maneuverable in heavy traffic and urban areas. 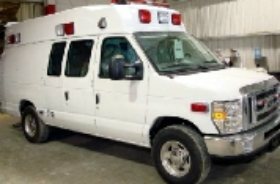 Dodge Type 2 Van Chassis are not available at this time from the chassis manufacturer since they do not meet Federal Guidelines for ambulance construction (please call for details).